Designed for office use, the MFC-L2700DN is an All-in-One device. 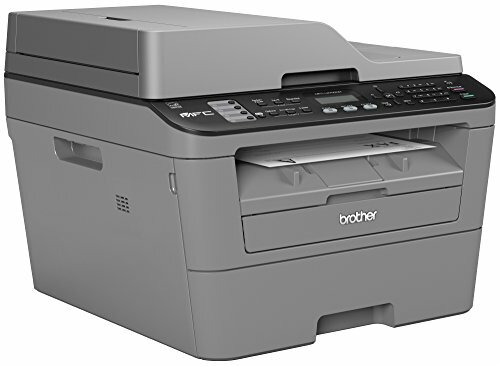 Based on a mono laser printer, this product combines Fax, Scan and Copy facilities with an ADF (Automatic Document Feeder). The ‘DN’ of the product’s title indicates that you also get Duplex and Networking capabilities. Rather dull looking, with its gun-metal and black color scheme, the MFC-L2700DN has dimensions of 409 x 398.5 x 316.5mm (W x D x H). The make up of this device follows the standard layer arrangement of a paper tray, printer, scanner and ADF modules. Along with the 250-page capacity main paper tray, there is also a manual feed slot positioned below the main paper output opening. When printing thicker material, such as envelops and card, you can opt for a straight-through paper path with the exit from an opening at the rear of the unit. Positioned along the front of the A4 flatbed scanner is the unit’s control panel. There are buttons for various Fax operations, plus those for switching between the Fax, Scan and Copy modes and navigating through the unit’s menu system. Providing status and feedback information is a 2″ LCD screen. I found it particularly difficult to make out the messages that were being displayed on this screen even with the contrast level turned up to its maximum. After first inserting the supplied toner cartridge into the drum unit residing in the printer’s insides, you can install the necessary drivers and bundled software. As part of this process, you will need to decide whether the Brother device connects to a computer, either Windows or Mac, via USB or Ethernet network. In both cases, the connection is at the rear of the all-in-one and you will need to provide the necessary lead. Once the on-screen instructions have been followed, a system restart will be required. The print driver supplied with this model offers three quality levels, identified by their 300, 600 and 1200 dpi settings. Options including paper type and size plus whether to implement the Duplex mode and booklet style layouts are available. Using a 500-word text document I was able to duplicate the promised 24ppm print speed using all three quality levels. With Duplex turned on, a 6050-word document was printed on both sides of six pages in 59 seconds. Using the ADF feature, a six-page document was photocopied in 28 seconds. Print quality was good in all cases. When using the Fax facility you can dispatch a single page message direct from the scanner bed or use the ADF module when multiple pages are involved. Group mailings are possible using the 200 numbers that can be stored in the available memory. There is also a facility to store often used Fax numbers in a quick dial feature. The A4 flatbed scanner can produce images at up to 600 x 2400 dpi when delivered direct from the scanner’s glass plate. However if the ADF feature is used, when producing photocopies, then the resolution drops to 600 x 600 dpi. Scanned images sent to a computer can be saved and stored in PDF format. 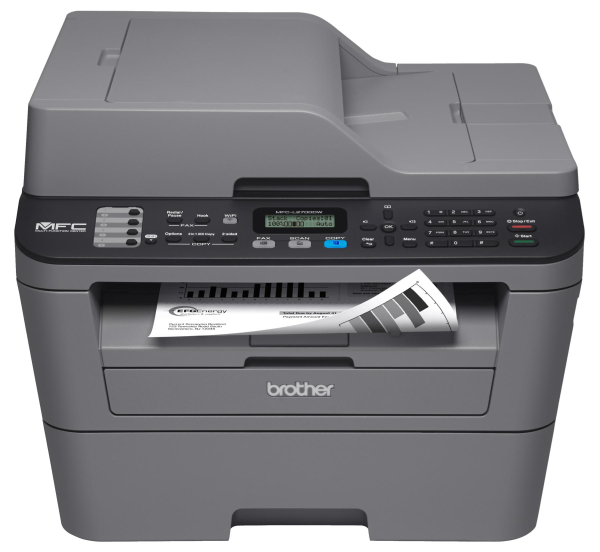 Remote scanning and printing is possible using the free Brother iPrint&Scan app or AirPrint. You can also send and retrieve documents from the Cloud with the help of various compatible apps. A capable all-in-one device for a small or home office.